With a pre-season official test just three weeks away January 24-25, BELL helmets/Drift Innovation/ChildFund International driver Pete Olson is preparing for the upcoming season and has moved to PS Racing for 2013. After a successful Asia Formula Renault [“AFR”] season in 2012, AFR is poised to conduct another popular season in 2013. With more than 20 cars on the grid in each race in 2012, and most races held at the highly-popular Pan Delta Race Festival weekends with total fan attendance of over 20,000, AFR is poised to conduct another stellar season this year. With a pre-season official test just three weeks away on January 24-25, BELL helmets/Drift Innovation/ChildFund International driver Pete Olson is confidently preparing for the upcoming season. 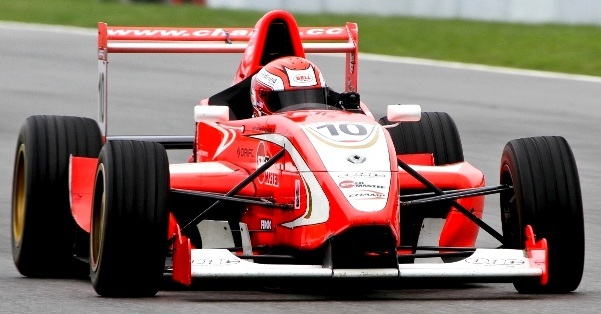 After finishing top ten in season points for his first full Formula Renault season last year, Olson has moved to PS Racing for the 2013 season. Headquartered at Zhuhai International Circuit, PS Racing is a leading AFR team, having taken the Championship Driver and Team trophies several times in the past few seasons since the team’s inception in 2007. Headed by Germany and two-time Asia Formula Renault Champion Pekka Saarinen, PS Racing is preparing to make another run on the Team and Driver Championship trophies for 2013. We wish Olson the best of luck in the 2013 Asia Formula Renault Championship and the upcoming Official Test days just three weeks away. For more information on Pete Olson, visit his website at http://www.peteolson.com, or his facebook fan page at http://www.facebook.com/peteolsonracing. For more information on PS Racing, visit http://www.facebook.com/psracingchampions.